Versatile doesn't even begin to describe the capability packed into the KM 56 RC-E KombiMotor. 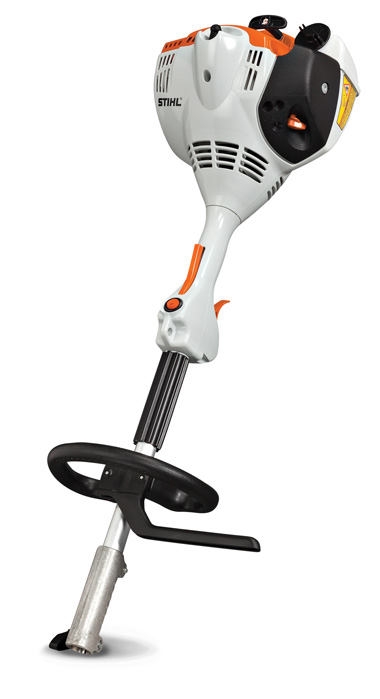 This multi-tasking tool features a low-emission STIHL engine that delivers both power and fuel efficiency. The KM 56 RC-E and its optional STIHL KombiSystem attachments are great for a wide range of jobs around the yard, from trimming and cutting, to edging and clearing. And thanks to its Easy2Start™ system, the only thing standing between you and your day is an easy pull of the starter cord. The STIHL KombiSystem is a family of multi-task tools, comprised of a STIHL KombiMotor and a comprehensive line of attachments. This line includes trimmers, blowers, hedge trimmers, edgers, pruners, cultivators and more. Each attachment slides into the KombiMotor effortlessly and is secured via a quick-release coupling system. The KombiSystem offers great power and flexibility for space-conscious homeowners.